The Battle of Brandywine, also known as the Battle of Brandywine Creek, was fought between the American Continental Army of General George Washington and the British Army of General Sir William Howe on September 11, 1777. The "Redcoats" of the British Army defeated the American rebels in the Patriots' forces and forced them to withdraw northeast toward the American capital and largest city of Philadelphia where the Second Continental Congress had been meeting since 1775. The engagement occurred near Chadds Ford, Pennsylvania during Howe's campaign to take Philadelphia, part of the American Revolutionary War (1775-1783). More troops fought at Brandywine than any other battle of the American Revolution. It was also the longest single-day battle of the war, with continuous fighting for 11 hours. Howe's army departed from Sandy Hook, New Jersey across New York Bay from the occupied town of New York City on the southern tip of Manhattan Island, on July 23, 1777, and landed near present-day Elkton, Maryland, at the point of the "Head of Elk" by the Elk River at the northern end of the Chesapeake Bay, at the southern mouth of the Susquehanna River. Marching north, the British Army brushed aside American light forces in a few skirmishes. General Washington offered battle with his army posted behind Brandywine Creek - off the Christina River. While part of his army demonstrated in front of Chadds Ford, Howe took the bulk of his troops on a long march that crossed the Brandywine far beyond Washington's right flank. Due to poor scouting, the Americans did not detect Howe's column until it reached a position in rear of their right flank. Belatedly, three divisions were shifted to block the British flanking force at Birmingham Friends Meetinghouse and School, a Quaker meeting house. After a stiff fight, Howe's wing broke through the newly formed American right wing which was deployed on several hills. At this point Lieutenant General Wilhelm von Knyphausen attacked Chadds Ford and crumpled the American left wing. As Washington's army streamed away in retreat, he brought up elements of General Nathanael Greene's division which held off Howe's column long enough for his army to escape to the northeast. 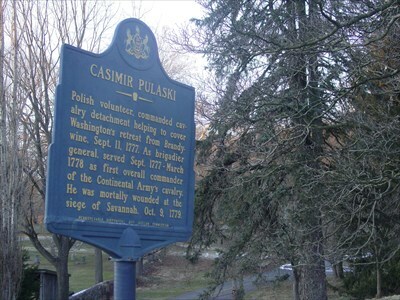 Polish General Casimir Pulaski defended Washington's rear assisting in his escape. The defeat and subsequent maneuvers left Philadelphia vulnerable. The British captured the city two weeks later on September 26, beginning an occupation that would last nine months until June 1778. The British grouped forces at nearby Kennett Square. Howe, who had better information about the area than Washington, had no intention of mounting a full-scale frontal attack against the prepared American defenses. He instead employed a flanking maneuver, similar to that used in the Battle of Long Island. About 6,800 men under the command of Wilhelm von Knyphausen advanced to meet Washington's troops at Chadds Ford. The remainder of Howe's troops, about 9,000 men, under the command of Charles, Lord Cornwallis, marched north to Trimble's Ford across the West Branch of the Brandywine Creek, then east to Jefferies Ford across the East Branch (two fords that Washington had overlooked), and then south to flank the American forces. At 5:30 a.m. the British and Hessian troops began marching east along the "Great Road" (now Route 1) from Kennett Square, advancing on the American troops positioned where the road crossed Brandywine Creek. The first shots of the battle took place about 4 miles west of Chadds Ford, at Welch's Tavern. Elements of Maxwell's continental light infantry skirmished with the British vanguard (primarily the Queen's Rangers – a battalion of loyalists). The British continued to advance and encountered a greater force of continentals behind the stone walls on the Old Kennett Meetinghouse grounds. The battle was fought at mid-morning around the meeting house while the pacifist Quakers continued to hold their midweek service. One of the Quakers later wrote, "While there was much noise and confusion without, all was quiet and peaceful within." The main British column under General Cornwallis (and accompanied by General Howe) set out from Kennett Square at 5:00 a.m.. Local loyalist sources had provided Howe with knowledge of two unguarded fords, above the forks of the Brandywine. The 17 mile flank march took approximately 9 hours to complete. The British appeared on the Americans' right flank at around 2 p.m. and took a much needed rest on Osbourne's Hill, a commanding position North of the Continental army. Having received intelligence from Colonel Bland's scouts, Washington ordered Sullivan to take overall command of Stirling and Stephen's divisions (in addition to his own) and quickly march North to meet the British flank attack. As they were forming their lines north of Dilworth, Howe launched his attack. Having taken overall command of the right-wing of the army, Sullivan left his division to confer with the other generals. His own division he left under the command of Preudhomme de Borre, with orders to shift to the right in order to link up with Stirling and Stephen's divisions (from left to right the divisions were arranged as Sullivan, Stirling, Stephen). As the British lines advanced the Hessian Jaegers threatened to flank the American right forcing Stephen and Stirling to shift right. Howe was slow to attack, which bought time for the Americans to position some of their men on high ground near Birmingham Meetinghouse, about a mile (1.6 km) north of Chadds Ford. By 4 p.m., the British attacked. The British Brigade of Guards caught de Borre by surprise on the American left, before de Borre had time to fully form, and immediately sent them in to disarray, causing the entire division to rout. Initially, Stephen's and Stirling's divisions held firm, aided by a battery of artillery on a knoll between their divisions. However, the British light infantry battalions, aided by the Jaegers, eventually caused Stephen's division to fall back. A bayonet charge by the British grenadier battalions, in the center, similarly forced Stirling to retreat. Lafayette had only just arrived, joining Stirling's division, when he received a wound while trying to rally the retreating troops. Around 6 p.m., Washington and Greene arrived with reinforcements to try to hold off the British, who now occupied Meeting House Hill. Washington conferred with Greene and Knox, the latter of whom was head of artillery, in the yard of the William Brinton house. The 2nd Battalion of Grenadiers was nearing their position, and was joined by a fresh reserve brigade (the 4th British Brigade). It was determined that Knox would deploy artillery to slow the British advance. Greene's reinforcements, combined with the remnants of Sullivan's, Stephen's, and Stirling's divisions, formed south of Dilworth and stopped the pursuing British for nearly an hour, letting the rest of the army retreat. When darkness fell, Greene's division finally began the march to Chester along with the rest of the army. The British army was not able to pursue due to the onset of night. The Americans were also forced to leave behind many of their cannons on Meeting House Hill because almost all of their artillery horses were killed. Upon hearing the attack of Cornwallis's column, Knyphausen launched an attack against the weakened American center across Chadds Ford, breaking through the divisions commanded by Wayne and William Maxwell and forcing them to retreat and leave behind most of their cannon. Armstrong's militia, never engaged in the fighting, also decided to retreat from their positions. Further north, Greene sent Brigadier General George Weedon's troops to cover the road just outside the town of Dilworth to hold off the British long enough for the rest of the Continental Army to retreat. Darkness brought the British pursuit to a standstill, which then allowed Weedon's force to retreat. The defeated Americans retreated to Chester where most of them arrived at midnight, with stragglers arriving until morning. The American retreat was well-organized, largely due to the efforts of Gilbert du Motier, Marquis de Lafayette, who, although wounded, created a rally point that allowed for a more orderly retreat before being treated for his wound. The official British casualty list detailed 587 casualties: 93 killed (eight officers, seven sergeants and 78 rank and file); 488 wounded (49 officers, 40 sergeants, four drummers and 395 rank and file); and six rank and file missing unaccounted for. Only 40 of the British Army's casualties were Hessians. Historian Thomas J. McGuire writes that, "American estimates of British losses run as high as 2,000, based on distant observation and sketchy, unreliable reports". Most accounts of the American loss were from the British. One initial report by a British officer recorded American casualties at over 200 killed, around 750 wounded, and 400 prisoners taken, many of them wounded. A member of General Howe's staff claimed that 400 rebels were buried on the field by the victors. Another British officer wrote that, "The Enemy had 502 dead in the field". General Howe's report to the British colonial secretary, Lord George Germain, said that the Americans, "had about 300 men killed, 600 wounded, and near 400 made prisoners". No casualty return for the American army at Brandywine survives and no figures, official or otherwise, were ever released. The nearest thing to a hard figure from the American side was by Major General Nathanael Greene, who estimated that Washington's army had lost between 1,200 and 1,300 men. On September 14, 350 wounded Americans were taken from the British camp at Dilworth to a newly established hospital at Wilmington, Delaware. This would suggest that of the "near 400" prisoners reported by Howe, only about 50 had surrendered unwounded. If General Greene's estimate of the total American loss was accurate, then they had between 1,160 and 1,260 killed, wounded or deserted during the battle. The British also captured 11 out of 14 of the American artillery pieces. Among the American wounded was the Marquis de Lafayette. In addition to losses in battle, 315 men were posted as deserters from Washington's camp during this stage of the campaign. The American Battlefield Trust and its partners have acquired and preserved 10.4 acres (0.042 km2) of the battlefield. The 10th Virginia Regiment was raised on December 28, 1775, in western Virginia for service with the Continental Army. The regiment would see action at the Battle of Brandywine, Battle of Germantown, Battle of Monmouth and the Siege of Charleston. Most of the regiment was captured at Charlestown, South Carolina, on May 12, 1780, by the British and the regiment was formally disbanded on November 15, 1783. The 12th Virginia Regiment was raised on September 16, 1776, at Williamsburg, Virginia, for service with the (U.S.) Continental Army. The regiment saw action in the Battle of Brandywine, Battle of Germantown, Battle of Monmouth and the Siege of Charleston. Most of the regiment was captured at Charlestown, South Carolina, on May 12, 1780, by the British and the regiment was formally disbanded on January 1, 1783. The 13th Pennsylvania Regiment, also known as The Pennsylvania State Rifle Regiment and Miles's Regiment, was raised March 6, 1776, as a state militia regiment and later for service with the Continental Army. The regiment would see action during the New York Campaign, Battle of Trenton, Battle of Princeton, Battle of Brandywine, Battle of Germantown and the Battle of Monmouth. The regiment was merged into the 2nd Pennsylvania Regiment on July 1, 1778. The 1st Virginia Regiment was an infantry regiment of the Virginia Line that served with the Continental Army during the American Revolutionary War. It was raised, on July 17, 1775, at Williamsburg, Virginia as a state militia unit, and later saw service with the (U.S.) Continental Army. Its origins go back to the Charles City-Henrico County Regiment of Militia founded in 1652. During the French and Indian War, the Virginia Regiment was commanded by Colonel George Washington. The regiment saw action at the Battle of Great Bridge, New York Campaign, Battle of Trenton, Battle of Princeton, Battle of Brandywine, Battle of Germantown, Battle of Monmouth, Battle of Stony Point and the Siege of Charleston. Most of the regiment was captured at Charlestown, South Carolina, on May 12, 1780, by the British and the regiment was formally disbanded on November 15, 1783. The 2nd Connecticut Regiment was authorized in the Continental Army on 16 September 1776. It was organized between 1 January and April 1777 at Danbury, Connecticut of eight companies from the counties of Fairfield, Windham, and Hartford in the state of Connecticut and assigned on 3 April 1777 to the 1st Connecticut Brigade of the Highlands Department. The regiment was reassigned to McDougall's Brigade on 12 June 1777; then three days later (15 June 1777 it was reassigned to the 2nd Connecticut Brigade. One month later, 10 July 1777 the regiment was reassigned to 1st Connecticut Brigade. On 13 November 1777 the regiment was reassigned to the 2nd Connecticut Brigade of the Main Continental Army. On 1 May 1779 the 2nd Connecticut Brigade was reassigned to the Highlands department and the regiment was re-organized to nine companies on 11 July 1779. The regiment was reassigned to the Main Continental Army on 16 November 1779. It was reassigned to the Highland's department on 27 November 1780. On 1 January 1781 the regiment was merged with 9th Connecticut Regiment, re-organized and re-designated as the 3rd Connecticut Regiment of the 1st Connecticut Brigade. The regiment would see action in the New York Campaign, Battle of Brandywine, Battle of Germantown and the Battle of Monmouth. The regiment was furloughed 15 June 1783 at West Point, New York and disbanded on 15 November 1783. The 3rd New Jersey Regiment was raised on January 1, 1776, at Elizabethtown, New Jersey for service with the Continental Army. The regiment saw action at the Battle of Valcour Island, New York Campaign, Battle of Brandywine, Battle of Germantown, Battle of Monmouth, Sullivan Expedition and the Battle of Springfield. The regiment was disbanded on January 1, 1781, at Pompton, New Jersey. One of the captains of this regiment was Jonathan Dayton, the youngest signatory of the United States Constitution. The 4th Connecticut Regiment was raised on April 27, 1775, at Hartford, Connecticut. The regiment saw action in the Invasion of Canada. After which the regiment was disbanded on December 20, 1775, and reformed on September 16, 1776, to fight in the Battle of Brandywine, Battle of Germantown and the Battle of Monmouth. The regiment was merged along with the 3rd Connecticut Regiment into the 1st Connecticut Regiment on January 1, 1783, at West Point, New York. The 4th Continental Light Dragoons also known as Moylan's Horse was raised on January 5, 1777, at Philadelphia, Pennsylvania, for service with the Continental Army under Colonel Stephen Moylan. The regiment entered the history books by taking the field in captured British scarlet coats as noted in a letter from General George Washington to Colonel Moylan dated May 12, 1777, in which Moylan was directed to have his uniforms dyed to avoid confusion with British dragoons. The regiment changed to green coats faced in red during the summer of 1778, with Tarleton helmets (black leather helmets in the style associated with Banastre Tarleton). The regiment saw action at the Battle of Brandywine and the Battle of Germantown in their scarlet uniforms, and the Battle of Guilford Court House and the Siege of Yorktown in their more familiar green coats. The regiment was furloughed June 11, 1783, at Philadelphia and disbanded on November 15, 1783. The 4th North Carolina Regiment was authorized on January 16, 1776 and established on April 15, 1776 at Wilmington, North Carolina for service with the Continental Army Southern Department under the command of Thomas Polk. The regiment saw action at the Battle of Brandywine, Battle of Germantown, Battle of Monmouth and the Siege of Charleston. The regiment was captured by the British Army at Charlestown, South Carolina, on May 12, 1780. The regiment was disbanded on January 1, 1783. The 4th Virginia Regiment was raised on December 28, 1775, at Suffolk Court House, Virginia, for service with the Continental Army. The regiment saw action at the Battle of Trenton, Battle of Princeton, Battle of Brandywine, Battle of Germantown, Battle of Monmouth and the Siege of Charleston. Most of the regiment was captured at Charlestown, South Carolina, on May 12, 1780, by the British and the regiment was formally disbanded on January 1, 1783. The 5th Virginia Regiment was raised on December 28, 1775, at Richmond, Virginia, for service with the U.S. Continental Army. The regiment saw action at the Battle of Trenton, Battle of Princeton, Battle of Brandywine, Battle of Germantown, Battle of Monmouth and the Siege of Charleston. The regiment was joined to the 3rd Virginia Regiment on May 12, 1779. General William Russell and Col. Josiah Parker were two of its commanders. The 6th North Carolina Regiment was raised on March 26, 1776, at New Bern, North Carolina, for service with the Continental Army. The regiment saw action at the Battle of Brandywine, Battle of Germantown and the Battle of Monmouth. The regiment was furloughed at Purrysburg, South Carolina, on February 11, 1779, and disbanded on January 1, 1783. The 6th Virginia Regiment was raised on December 28, 1775, at Williamsburg, Virginia, for service with the Continental Army. The regiment would see action at the Battle of Trenton, Battle of Princeton, Battle of Brandywine, Battle of Germantown, Battle of Monmouth and the Siege of Charleston. The regiment was merged into the 2nd Virginia Regiment on May 12, 1779. The 8th North Carolina Regiment was authorized on November 26, 1776 and assigned to the Southern Department of the Continental Army. The unit saw action at the Battle of Brandywine and Battle of Germantown during the American Revolution. The Regiment was commanded by Colonel James Armstrong. The regiment was disbanded on 1 June 1778 at Valley Forge, Pennsylvania. The Battle of Paoli (also known as the Battle of Paoli Tavern or the Paoli Massacre) was a battle in the Philadelphia campaign of the American Revolutionary War fought on September 20, 1777, in the area surrounding present-day Malvern, Pennsylvania. Following the American retreats at the Battle of Brandywine and the Battle of the Clouds, George Washington left a force under Brigadier General Anthony Wayne behind to monitor and harass the British as they prepared to move on the revolutionary capital of Philadelphia. On the evening of September 20, British forces under Major General Charles Grey led a surprise attack on Wayne's encampment near the Paoli Tavern. Although there were relatively few American casualties, claims were made that the British took no prisoners and granted no quarter, and the engagement became known as the "Paoli Massacre." George Washington learned of Howe's plans, and prepared for battle. Before the two armies could fully engage, a torrential downpour ensued. Significantly outnumbered, and with tens of thousands of cartridges ruined by the rain, Washington opted to retreat. Bogged down by rain and mud, the British allowed Washington and his army to withdraw. Brandywine Battlefield Historic Site is a National Historical Landmark. The historic park is owned and operated by the Pennsylvania Historical and Museum Commission, on 52 acres (210,000 m2), near Chadds Ford, Delaware County, Pennsylvania in the United States. It is part of the site of the Battle of Brandywine fought on September 11, 1777, during the American Revolution. The Battle of Brandywine covered more than ten square miles, or 35,000 acres. However, the modern park only covers 50 acres which served primarily as the Continental encampment the two days prior to the battle. The battle was a decisive victory for the British and cleared a path directly to the rebel capital of Philadelphia. Brandywine Battlefield Park became a Pennsylvania State Park in 1949 and a National Historic Landmark in 1961. To the north, another part of the battlefield is maintained by Birmingham Township, Chester County, Pennsylvania as "Battlefield of the Brandywine Park," or "Sandy Hollow Heritage Park." Much of the afternoon's fighting took place between Birmingham Friends Meetinghouse and Dilworthtown.On August 14, 2009, the state closed the battlefield and three other PHMC museums indefinitely due to a lack of funding as part of an ongoing budget crisis. The historic site opened again after 11 days, operating under an interim agreement between the PHMC and Chadds Ford Township with the Brandywine Battlefield Associates, or "Friends of Brandywine Battlefield" who now operate the site with staff and volunteers. Ottendorf's Corps was raised on December 5, 1776 in eastern Pennsylvania for service with the Continental Army. As Congress directed the corps would be composed of 150 privates, sergeants and corporals included and that it be divided as follows: "divided into three companies, the first to consist of 60 men, light infantry, to be commanded by one captain and two lieutenants. The other two companies of hunters (Riflemen), 45 men each, also commanded by one captain, two lieutenants." The corps saw action at the Battle of Germantown and Battle of Brandywine. In April 1778 the Corps was broken up, one company was transferred to Armand's Legion and the others became independent companies of dragoons.